Learn how Arcserve the Unified Data Protection portfolio delivers comprehensive Assured Recovery™ for virtual and physical environments with a next generation unified architecture and unmatched ease of use. This feature-rich solution allows users to seamlessly scale their data protection needs, and allows them to achieve their recovery point and recovery time objectives. Overly complex traditional backup policies are replaced by modern, task-based data protection plans. Deep integration with industry-leading hypervisors enables the automation of complex, repetitive tasks. The Arcserve UDP portfolio also includes the UDP7000 Series appliance offering. This unique set and forget solution provides all the power of UDP in an appliance form factor, and is easy to deploy and manage. The Arcserve Unified Data Protection portfolio eliminates the need to have multiple data protection vendors. Come join this informative session to learn how to achieve all of this in a simple, unified management console! Hyperscale clouds get all of the press, but is it really a case of “go big or go home”? The giant cloud providers offer great prices on bulk storage but the cloud can act as much more than just a backup destination. There’s a lot of value residing within the individual cloud offerings of the data protection vendors, with an entire spectrum of services ranging from standard backup storage to Managed Archiving to Disaster Recovery as a Service. And more. Join us on this panel discussion to learn about what’s available and how to take full advantage of the range of cloud services offered so that you can precisely match vendors’ offerings to your business needs. While some pundits argue that disaster recovery is dead, the truth is that the need for effective planning for data protection and operational recovery has never been greater. As new technologies are introduced to enable greater agility in data centers, we have become more dependent on the continuous operation of systems. The old rules still apply: we need to understand the criticality of the different workload in our shops, their time to data requirements, and where apps and data are hosted as a precursor to defining recovery strategies. The good news is that new technologies are enabling improvements in the traditional process, including the streamlining of disk-based backups with de-duplication technology and the rapid re-hosting of certain workload in Disaster Recovery as a Service (DRaaS) clouds. The situation is both challenging and exciting: the stalwarts of effective continuity planning remain the same, but DR may also be the testing laboratory for technology innovations in hosting, storing and networking data. Did you know that Google protects all of its Gmail and Google Apps data in the cloud with tape? Did you know that the National Center for Supercomputing stores over 300 PB’s of near-line data on tape? If not, then you should attend this important new webcast. In this presentation, Arcserve will describe how tape continues to evolve and improve and how tape media continues to play an important role in your data center. The idea of data deduplication is commonly tossed around in today’s IT world, especially within data protection circles. But while the concept might be simple, how it gets executed varies greatly and how deduplication is implemented can have a serious impact on production processes and cost. Shrinking your storage footprint exponentially or not so much depends on the decisions you make. Find out about the challenges and benefits you may come across when applying deduplication to your backups in this can’t miss webcast! • Top trends around the evolution and adoption of virtualization in the marketplace today. • Cloud has come of age. It's no longer just a buzz word. • Key points we learned from analysts throughout the event. • Major product announcements from VMworld 2015. Learn about the powerful, new Arcserve Cloud which is a fully-integrated, cloud data protection solution for backup, disaster recovery and long-term retention. It’s offered as a service extension to Arcserve’s Unified Data Protection (UDP) appliance. Also discover technical details of Arcserve UDP, a next-generation data protection solution that leverages global deduplication, encryption, compression, and WAN-optimized replication. When it comes to realizing the lofty goals of agile IT service delivery, non-stop data is a prerequisite. Non-stop data is stored both for fast access and for long term preservation, protection and analysis. It is evidenced by uncompromising application performance and continuous and compliant data availability. Non-stop data is the heart of always-on business processes. This webcast will identify what non-stop data is all about and what are the best practices for enabling data for optimal usage by contemporary businesses. Your expensive, complex, headache-inducing data protection architecture is rapidly becoming obsolete. Powerful next generation solutions are entering the market, and they’re empowering small¬ to mid-size businesses to manage their data with the robust technologies once reserved for enterprise. Now, easy¬to¬implement physical data protection appliances; emerging, cloud-native appliances; unified data protection and recovery technologies; and all-inclusive licensing make protecting against system disruptions and data loss more efficient and effective than ever. Join Bob Spurzem as he discusses how to navigate this new era of data protection. Are you ready? Arcserve® High Availability provides server high availability, protecting your operating system, applications and data. Arcserve® High Availability supports Windows, Linux and UNIX systems. Arcserve® High Availability includes LAN and WAN replication, Continuous Data Protection (CDP) and Automated Recovery Testing (Assured Recovery), to quickly and easily replicate data from one site to another. Together with real-time server health monitoring, automated or push-button failover or failback, Arcserve® High Availability provides uninterrupted access to applications and data, in the event of a primary server failure - be that a planned or unplanned outage or even man-made or natural disaster. • Discussion around how high availability can protect form a disaster, planned or otherwise. Join Chris Evans as he discusses Arcserve® High Availability features, functions and benefits for Continuous Data Protection in your data environment. Join Charlie Smith as he discusses Arcserve® High Availability features, functions and benefits for Continuous Data Protection in your data environment. Now you can “set and forget” with the latest backup and recovery innovation from Arcserve: Arcserve® Unified Data Protection (UDP) Appliance. Be the first to learn how you can benefit from the most complete and cost-effective data protection appliance in the market, featuring Assured Recovery™. •Discover how to achieve unmatched ease of deployment and usability with this newly architected appliance. •Learn about cloud-native capabilities, including the broadest feature set in the market today. You can’t miss this one – it’s a revolution, not just an evolution. Choosing a data protection solution is arguably one of most difficult decisions that organizations of all sizes (enterprise) need to make. Organizations expect data protection solutions to provide more feature functionality than ever to meet their growing needs for consolidated backup and recovery, instant recoveries, physical and virtual backups and cloud based recoveries, just to name a few. The issue becomes how well do these expectations map to the features shipping on today’s data protection solutions. In this webinar, DCIG’s Lead Analyst Jerome Wendt will examine the top trends in data protection solutions and which of next generation features are actually shipping and available so that enterprises can properly align their expectations with the realities of today’s data protection solutions. 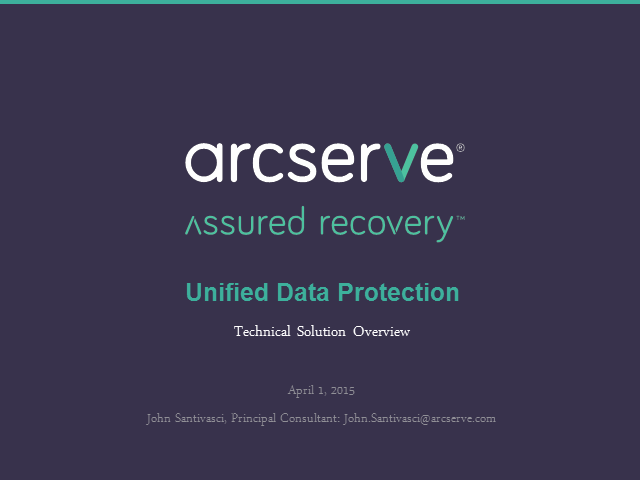 You’ve already heard that Arcserve Unified Data Protection delivers comprehensive Assured Recovery™ for virtual and physical environments with a next generation unified architecture and unmatched ease of use. -Recovery Point Server:A key feature of UDP, the RPS isn’t just a central target for data. It also enables higher functions such as encryption and data deduplication. For customers with multiple data centers, enabling local and remote RPSs will allow for highly efficient bandwidth-controlled replication of recovery points to an alternate destination. -Global Deduplication:It’s not last year’s deduplication! UDP allows true enterprise-wide deduplication, at the source node, the RPS server, and all other nodes in the environment. Ensure your data storage requirements are managed, while maintaining operational efficiency across the entire network - simply, effectively. The Arcserve portfolio of products provides a comprehensive solution for data protection – delivering recovery and availability of your virtual and physical server systems, applications and data. It delivers a solution for a wide range of complex environments to help you simplify data protection and reduce costs. Traditional approaches to backup fail when there are multiple point solutions, rigid compatibility requirements and silos of data protection when addressing a mix of physical and virtual platforms. Come see how your organization can benefit from increased capability, reduced cost and complexity, and accelerate toward your data protection goals. Come see Arcserve! In this webcast, James Russell and Christophe Bertrand cover the new features of UDP Update 2. Learn how Arcserve UDP delivers comprehensive Assured Recovery™ for virtual and physical environments with a next generation unified architecture and unmatched ease of use. Learn how arcserve UPD delivers comprehensive Assured Recovery™ for virtual and physical environments with a next generation unified architecture and unmatched ease of use.